The ULTIMATE list of things to do in Nashville with kids! As a native Nashvillian and a professional nanny in the city for 10 years, I know most of the best spots to take kids in Nashville, Tennessee. The first full-size aerial adventure park in the United States is Soar Adventure Tower, located in Franklin, TN. At 50 feet tall, the 10,000-square-foot play area has more than 120 climbing elements. For ages 3 and up. Want to see some of the sights but don't have a car? Check out Music City Trolley Hop (ages 4+) Hop on and off at your leisure, discovering Nashville along the way. Stops include Ryman Auditorium, Bicentennial Park, the Parthenon, the Country Music Hall of Fame, Antique Archaeology and the Frist Center for the Visual Arts. If you have a little history buff (or a big!) the Tennessee State Museum always has fascinating exhibits. This museum is located in the James K. Polk building, which also houses TPAC (Tennessee Performing Arts Center), where many great shows, such as Wicked and Lion King, perform! Check their calendar to try to catch a show! Also for history buffs (and free! ): the Tennessee State Capitol (guided tours are available daily). Our capitol building is haunted and if you listen carefully you might hear arguments in the walls! After your game of laser tag, walk down 2nd Avenue to The Old Spaghetti Factory and eat your heart out! (They have gluten free options!) My favorite thing on the menu: the signature spumoni ice cream for dessert, which comes with every entree! Other great kid friendly restaurants downtown are Pucketts, Copper Kettle, Demos, Jacks BBQ and Hot Diggity Dog. If I had to choose one place to eat downtown with kids, it would be Puckett's. Check out their calendar for music and events, as they always have great live music! Be sure and get some of the BBQ, but they also have a great Sunday brunch. For the older kids, ages 12 and up, I recommend checking out The Escape Game, where you have one hour to solve million dollar heists, decode secret service missions, and navigate through prison passageways. This has been voted the "#1 Fun Thing to do in Nashville" by Trip Advisor and there is now a location on 3rd avenue for those of you staying downtown! If you want a taste of something sweet, I would like to recommend a stop at Savannah's Candy Kitchen or Mike's Ice Cream Shop which are both located on Broadway. I like to take my ice cream down to Riverfront Park and watch the boats go by or take a walk across the Shelby Street Pedestrian Bridge. If you want a great picture of the family in front of the Nashville skyline- this is the spot! The bridge is also a great place for a good view of LP Field, where the Titans play, and across the bridge you can make a stop at Cumberland Park, which has an awesome "splash pad"! Other sweet spots to note are Bang Candy Company (get their marshmallows), Las Paletas (yummy gourmet popsicles), Jeni's Splendid Ice Cream (my #1 choice for ice cream), Bobbies Dairy Dip, and Olive and Sinclair (chocolate shop). I guess you could say we have quite a sweet tooth here in Nashville! If your family likes baseball, come check out our new Nashville Sounds stadium for a game! Check their website for discounts and fireworks night schedules. Even if you aren't a baseball fan, it makes for a great summer night outing with the family! Do you have a little Taylor Swift or Johnny Cash in your family? The Country Music Hall of Fame, Johnny Cash Museum (Johnny Cash's gravesite is in Hendersonville) and The Ryman might be a couple places you will find yourself! Of course, being Music City, there are endless options and places to get in touch with your musical side, these are just two of my favorites! (Adults, I highly recommend Roberts for your boot scootin' honky tonk needs) While you are at the Country Music Hall of Fame, visit Hatch Show Print- check the website to see if you can join them in making letterpress art while you are there. Take a drive down Natchez Trace Parkway in the fall and eat breakfast at the famous Loveless Cafe. Their biscuits are the best on this side of the Mason-Dixon! Check out the Loveless shops for souvenirs native to Nashville. Did you know that Nashville is home to a full scale replica of the original Parthenon in Athens? And, wow, what a sight it is! Visit Athena inside it's doors and be sure and take a look at the art galleries, too. Take a ball and a picnic blanket on a warm day and enjoy beautiful Centennial Park! In the spring and summer you are likely to catch a free, live show, Movies in the Park or a festival. Look for the train and the tulip garden for a gorgeous picture backdrop in the spring and in the off seasons take a stroll around the beautiful Lake Watauga or let the kids play at the playground. Hike at Radnor Lake and look for local wildlife. This is my favorite place to escape in the city and go for a walk. Nashville Zoo is known for its amazing treehouse playground, be sure to see Grassmere Historic Home and Farm and get up close to a kangaroo in Kangaroo Kickabout! Nashville Zoo has a full cafeteria with healthy food options or bring a picnic! If you can visit the zoo during the months of March- June be sure and get tickets for DinoTrek. Nashville residents- check out Zoo Tots for 18 months- 5 years old. Cheekwood Art and Gardens is a MUST SEE and has year round events and exhibits for visitors, including Tuesdays for Tots and Museum Minute. While you are at Cheekwood, be sure and make a stop at Percy Warner park and count the stairs! This is another one of my favorite places in Nashville to take a walk. Adventure Science Center is an awesome indoor option for little scientists. (Open daily, 10:00- 5) Try climbing to the top of the pyramid for a great view of the city! There is a Subway restaurant on the second floor if you'd like to eat lunch there. To avoid visiting during school field trips, plan on going after 1:00. If you have a little farm lover, Tennessee Agricultural Museum has lots of wonderful events and activities, including a Music & Molasses Arts & Crafts Festival and a Historic Rural Life Festival. Also see: Summer Saturdays. Go to Nashville Children's Theatre, a professional theatre company providing the children, families and educators of Middle Tennessee with extraordinary shared theatrical experiences that inspire imagination, develop creativity, and build community. For your little car aficionados, check out Lane Motor Museum, which houses the largest European collection in the U.S. Be sure and see the huge landing craft out back! I consider this museum one of Nashville's best treasures that not many know about. Nashville Shores Water Park (jet-skis, paddle boats and water slides for all ages) and Wave Country for your little surfers. About 30 miles south of Nashville you can find Hatcher Family Dairy, which offers farm tours where you can experience farm life first hand! Gentry's Farm is another local favorite, located in Franklin, TN. We love Gentry's Farm in the fall because it's full of pumpkin patches, hay rides and corn mazes! Speaking of Franklin, TN... What a Tennessee gem! If you can get out there, you should! Downtown is "America's Favorite Main Street" and I would recommend the Farmers Market on a Saturday and eating at a local restaurant on Main Street! The "I Spy" tour from Franklin on Foot is a great way for kids and adults to tour together. You could easily spend an entire day in Franklin with kids! About 30 minutes southeast of Nashville is Murfreesboro, which has a great science center, Discovery Center. They have a super slide, a farmers market and house where kids can play pretend and much more! Tip: there is a Chic-fil-a in Murfreesboro with a play place that is always a hit for lunch after a visit to the science center to make a day of it. For a laid-back family friendly, southern style evening featuring Middle Tennessee's finest bluegrass music under the light of a full moon, join us for a Full Moon Pickin' Party. If you aren't able to attend, I still suggest a visit to Warner Parks! They will loan out their Purple Packs, which have a different theme for each season and I love the Nature Play Playground. Although Nashville no longer has what my generation's childhood remembers, Opryland (1972-1997 and, yes, we STILL miss the Grizzly River Rampage! ), if you are staying in the Opryland area, you're in for a treat. 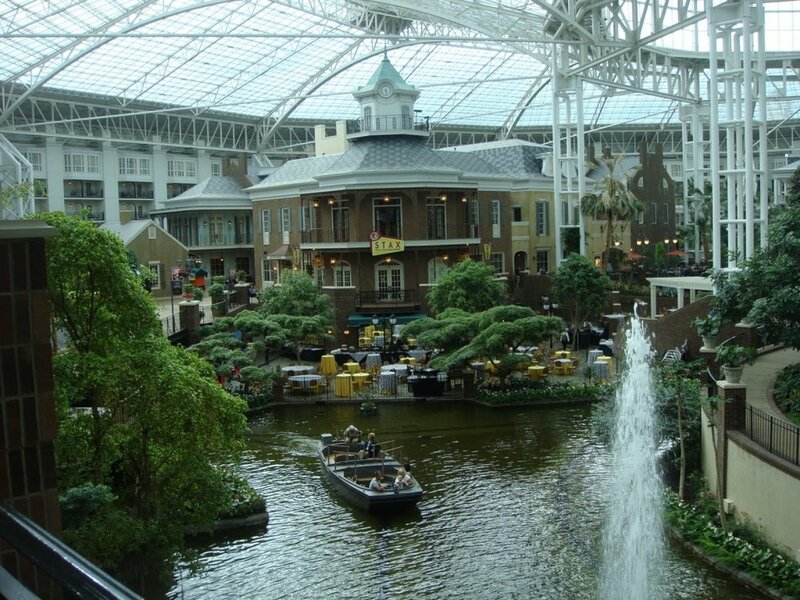 Opryland Resort is open to the public (don't park on site to avoid the $20 parking fee) and the botanical garden atrium is a lot of fun for kids. Incredible waterfalls, a river complete with Delta River Flatboat Tour, and fountain shows. If you visit around Christmas time A Country Christmas and ICE are absolutely a MUST SEE! Opry Mills has great shopping and I love going to Dave and Busters for dinner, bowling and games. Also recommended is the underwater dining experience, Aquarium Restaurant. Book your tickets online for a truly unique experience on the General Jackson Showboat (I have fond memories as a child on this cruise) and stop in to the Grand Ole Opry to say hello to the show that made country music famous. Another favorite activity in this area is Grand Old Golf for mini golf and GoKart fun! One of Nashville's favorite parks is one we refer to as Dragon Park but is actually called Fannie Mae Dees Park and it's a great spot to get the kids out to play or have a picnic. Skip the line at Pancake Pantry and eat breakfast at Fido instead (if you really want pancakes try going to The Pfunky Griddle), eat lunch at Pizza Perfect, and I would recommend Jackson's for dinner. Across the street you will find Brushfire Pottery Studio, but keep in mind you have to wait a week to pick up your creations, so this is best left to the locals. Last recommendation I have to make is fun for both kids and adults; Sky High Sports trampoline park. You can make reservations online and print the waivers needed before going to save time. On one side of the gym there is a toddler court, a kid’s court (ages 8 and younger only) and a private court available for parties. On the other side is a foam pit, dodgeball court and an open trampoline court. If you have any other recommendations to add to this list, I would love to hear them!